Ok, so Mel (The Amazing Shrinking Mom)hyphenates her weigh-in, so I will too. I "released" another 1.5 pounds this week! I now weigh 163, a total loss of 74 pounds! Jason and Anna Marie went to Wendy's today for lunch (I went to a meeting about growing your own tomatoes, because that's something I'm determined to do this summer) and the manager (one of our city's aldermen) told him that he was going to ask me about Weight Watchers. He said he's decided he has to do something. Come on girls - how are y'all doing? 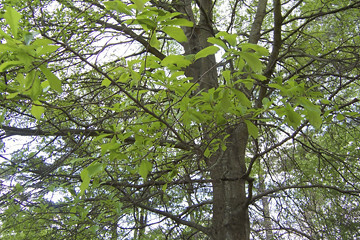 A tree growing back its leaves. 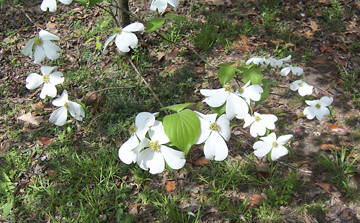 A dogwood tree in bloom. 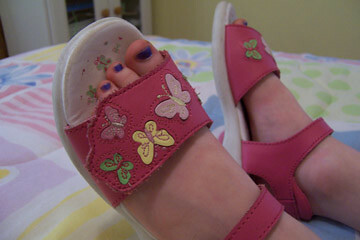 And blue sparkly toenails in pink butterfly sandals. I got this one from Heather over at Desperately Seeking Sanity. • 1945 - World War II: the Atomic bombing of Hiroshima. • 1984 - Pop star Prince releases Purple Rain, the album which would launch him to superstardom. • 1997 - Microsoft buys $150 million worth of shares of financially troubled Apple Computer. I was kinda bummed that I could only list two births, because there were LOTS of others - Lucille Ball, Eleanor Roosevelt, Robert Mitchum, and Jon Benet Ramsey. I actually already knew (thanks to Entertainment Tonight) that I share my exact birthday with Soliel Moon Frye - a.k.a. Punky Brewster. Man, I'm such a sucker for these types of useless knowlege posts! You know you hate it too, girls. I was in need of some new support, so I went to our local Big Box Store this afternoon. For many years now, I've only bought bras from Lane Bryant. With my ample bosom, it was the only store where I could find (not too expensive) bras that fit. Now that I don't have to shop there for clothes anymore, and my bosom isn't nearly so ample, I thought that I could go somewhere else. Oh, how I've paid for that line of thought. I took my measurements, and I guess that's where the problem started. At Lane Bryant, it's easy to find the right size. The band size is the measurement around your ribcage. The difference between that and your bust size becomes your cup size. But at the store, it was a different story. Of the few brands that had sizing instructions, they were different. Some said take the band measurement and add 3". Some said add 5". Some said add whatever it takes to get to the next even size. And asking for help? Puh-lease. I'm not even sure they'd have let me try anything on. After wandering around for half an hour, I left that department in disgust and just bought some cereal, some Yoplait Thick and Creamy Light Yogurt (I've become such a yogurt snob! )and some Edy's Slow Churned Light American Idol ice cream. I can't remember the flavor at the moment, but it has something to do with caramel and chocolate. 'Nuff said. I don't know when I'll get to a decent store to get a new bra. I hate to spend too much, since I'm still losing weight, but this fit fact insanity has got to stop. I couldn't even find a consensus on the web! So, if any of you have bra fit tips, I'd be glad to have them. At this stage in my life (and I've been wearing bras since I was about 11!) I know I should have this straight, but I'm afraid I don't! And I've got to get through this, because I just keep hearing that song from a Bette Midler movie (Beaches, maybe?) where she talks about the rivalry between a Mr. Titsling and a Mr. Brassiere, and who won the battle. I've got to get this song out of my head! I lost another pound and a half this week - taking me down to 164.5! This is me, doing the happy dance! I am Miss Unoriginal today. I was going to post a picture of myself wearing a SCARF in my HAIR (yes, I'm still Tragically Unhip, but with the prompting of Amanda and our Office Black Chick Felicia, I was trying to be less so). But, I can't get a satisfactory picture. Not one that showcases my hair and does not make my face look odd. And yes, I know that the answer is to not hold the camera myself, but I tried the self-timer thing today, and it didn't work so well. And so - I, ahem borrowed this idea from Sheila. I mean isn't that why people put stuff on their blogs? So people like me can copy it? 2. A SCARF! IN MY HAIR! 2. Did I mention I want a different car? 2. Cottage cheese (though not at the same time. 2. Hopefully go to Moe's, because we do that nearly every Friday. 2. Anywhere with Anna Marie when she's cranky. Oh, what the heck. I'll show my big nosed self anyway. I took this picture this morning to send to Amanda, who, by the way, had about a foot of her hair chopped off for Locks of Love this week and looks fabulous. Although the 'do got Felicia's approval, I'm still on the fence about it. 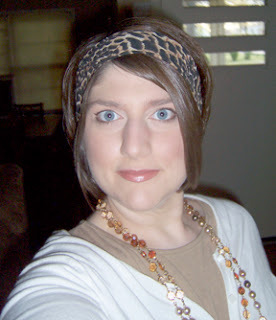 Man, first I'm gonna "Mom my ride" and now I'm putting scarves in my hair. A bellybutton ring can be the only next logical step. How did they get the footage of the inside of my van? All they need is for the driver's side door and the front fender to be blue - which wouldn't be so bad, because blue is my favorite color, except that the rest of the van isn't blue. It's maroon. And the CD player doesn't need to work, because I've got my input jack for my iPod. Does anyone remember what a hypotenuse is? Thanks for the quiz Valerie! On the plus side, I didn't gain anything either. So, here I sit at 166. On another note, I checked my BMI the other day, and I'm not obese any more! Yay for being just plain fat, and not obese! Ok girls, how are the rest of y'all doing? What do you do when KFC runs out of corn holding sticks? 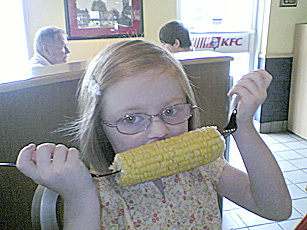 In case you can't tell, yes, that's two forks stuck in the ends of that cob o' corn. I can't take credit for the idea, though. My husband is the genius behind this one. I guess toothpicks would've worked as well, but since our KFC only very rarely has chicken (I'm not kidding!) I don't think they'd stock something as useful at a chicken place as toothpicks. Now, go an patent this idea somebody, and make lots of money. I'll only take the customary 15%. The babysitter's boy has been running fever the past few days, and she was taking him in today to see what the matter was. I kept Little AM myself, because my usual backup (Amanda) is having headaches and nausea from her concussion. So, we got up, ate our cereal, and got on with our day. We went to the auction where Jason and mom work for lunch. They were having an "Irish" themed day - corned beef and cabbage, and beef stew. And, for those who like neither, baked chicken with apples. Little AM discovered that she likes corned beef, very much. Afterwards, we went to Target (where I spent what I would've paid the babysitter on new clothes for the kid, but they were SO worth it) and back down to our neck of the woods so I could take Amanda to clean her car out. The damage was so much worse in the light of day than her nighttime pictures had shown. The back wheel was indeed gone, and the metal that had held it was badly bent. The sheet metal was peeled away from the frame, like a SPAM can. The trim was gone from the driver's side, along with the back door handle. The driver's side rearview mirror was broken out. And of the three remaining tires, two were flat. I took Amanda over to the Sheriff's Department, where I got Sheila the Clerk (and a mighty nice gal, by the way) to help us find out exactly what this bozo was charged with. We're still waiting on the accident report, because the troopers sometimes take up to 10 days to get them in. But, the guy was taken to county lockup, so we went there today. Let's see - DUI, driving with a suspended license, and leaving the scene of an accident. Did you get that second one? HE HAD NO LICENSE. He's been to this party before, folks. That's why he called his girlfriend after the wreck to come get him and/or pretend she was driving. He was too drunk to know he'd hit Amanda, but sober enough to realize that he was in big trouble when the law came. The best part: it wasn't even his car! He's drunk, no license, and driving someone else's car! Sheila told us the name of the owner, and I spied his name on his file as she held it. I'm thinking maybe it's his mama's car. And, it isn't paid for yet. It's a '98 Lexus, bought from one of the used car lots down here. Sheila said the lot had a lien against it (that's how we know it isn't paid for), and that lots of people buy their cars at this lot thinking they have insurance when they don't - they've only purchased credit life insurance, not auto coverage. So, if I understand things correctly, it's the car's owner who will be held liable if Amanda and/or her insurance company files a claim in this case. I'd really, really hate to think that the person whose car this is knew that he wasn't supposed to be out there in the first place. And I don't know about you, but when I borrow something, I'm extra special careful with it. Like, too careful to get drunk and hit someone on the interstate. And then try to run, only to get stopped half a mile down the road by a flat tire. Jerk. Too bad there isn't a charge like "blithering idiot." But I see at least one silver lining to this cloud: my dad had come to despise the "German engineering" in that car. To change the water pump, he had to take the engine nearly completely out! At least this idiot has saved him the trouble of having to work on the VW anymore. We spent Saturday at the Lichterman Nature Center in Memphis. It was a free day, so there were about 42,456,234 kids there. The sun was shining, a breeze was blowing, and Anna Marie learned that not all skulls come from dinosaurs. 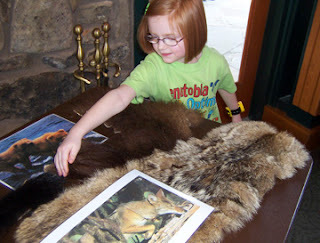 Then, she got to feel some pelts. They had pictures of their former owners attached. Where was PETA when these animals needed them? We also saw a puppet show about bees called "Zzub zzub." Anna Marie was in the front row and gave her two cents worth at every opportunity. After the puppet show, we went outside. 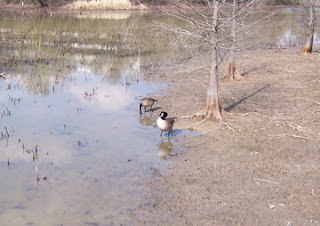 These are some Canada Geese that were in the "marsh" area. 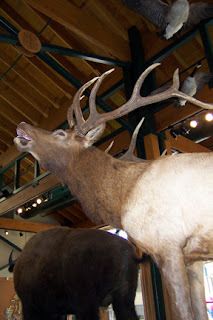 Hopefully, they were unaware that a flock of their kinfolk were stuffed and hanging from the vaulted ceiling of the main room. Anna Marie was trying her best to speak to them in their "honk" language, but for some reason they weren't responding. Hmm. She was also treated to seeing a really big turtle swim across the lake, and something I've never seen - one of these geese coming in for a landing and splashing water on all his goose friends. In another building, there were all sorts of animals that one might find in one's backyard. The dangerous ones were just plastic, though. That building also held the crafts tables, and she made a butterfly from a clothes pin, a little figure from pipe cleaners and beads, and a bookmark from feathers and dry flowers. After a trip to the gift shop (and a lesson on staying within her budget of about $3.50, earned by doing chores for my aunt) we headed back home. I really wish I had gotten more pictures, but the batteries died on my camera. They're rechargable, and we forgot to charge them, so we put them in the Jeep with the power inverter on the way up. It wasn't a long enough trip to charge them all the way. She was so excited, she said she wanted to come back more often. I'll have to make sure my dad (who was running a water line for his new next door neighbor, my aunt) and my mom (who was in Texas helping said aunt pack up some of her worldly belongings) can come with us. But it isn't the post it could've been, either. I was going to post about yesterday, about how we took Anna Marie to a nature center in Memphis and a good time was had by all. Maybe I'll post that story tomorrow. But today's post is a post of thankfulness. My parents were late to church this morning, and I joked with them about not setting their clocks up. Then my dad told me they'd had a rough night - seems that as Amanda was coming home, just before the exit, a drunk came over into her lane and sent her careening off the road and up an embankment. She was fine. Her car is not. She called my dad, and he came to check on her. He noticed another car a few feet up the road, pulled over. You guessed it. The SUV that hit Amanda's Volkswagon. There was one guy and two girls, and he was pretty obviously drunk. The only reason he'd stopped was because he hit Amanda so hard he blew a tire out. He told my dad that someone had hit him. When the state trooper arrived a couple of minutes later, my dad sent him down to talk to the other guy. My dad was afraid that they were getting ready to switch drivers. They were. And the real driver was taken to jail. The impact hit Amanda's car hard enough to knock the wheel off. Not the tire. The wheel. Dad went back today to try to find it, and it's just gone. So, she's driving our Corsica for a while. I don't know if the idiot in the SUV had insurance or not. She had liability on the VW, but in Mississippi we're required to have uninsured and underinsured motorist. I guess we'll have to see what comes of that. But for today, I'm just thankful. In a split second, my sister lost her car. In that same second, if not for God, the rest of us could've lost much more. I "released" 1.5 pounds this week! That puts me down a total of 71 pounds to 166! On another, unrelated note, Amanda, Jason, and I watched The Prestige tonight. Love me some Christian Bale. Anyway, we liked it, but we had some questions. Did any of you watch it? Were you slightly confused? Oh, the joys of having a five year old. And watching how their minds work. Jason and I were coming back from lunch today, discussing what I'd make for dinner. 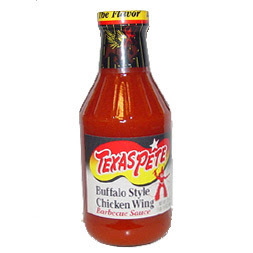 I asked him to take some chicken strips out of the freezer, and we could put them on the ole' George Foreman and toss them in some Texas Pete Hot Wing Sauce. Anna Marie pipes up from the back seat, "EEEWWW!" "You're going to put the strips in Texas pee? EEEWWW!" When I explained that I'd said "Pete" instead of "pee," she realized she had a joke on her hands. Since my mother is leaving today for a trip to Texas, I called to tell her. Thought it was most appropriate, ya know? Anna Marie got on the phone and informed her Gramma that her joke just got funnier each time she told it. Now, I may have to change my dinner plans - I don't know if I can eat those strips with a straight face. Or, I should say, we had a mouse. Or, I should say, we had mice. For the first time in our nearly nine years of marriage, we had to dispatch some rodents. It all started Friday night. My parents came over for the aforementioned peanut butter pie, and Jason discovered that some towels he'd put in the dryer before we left weren't dry yet. The air was working, but there was no heat. Or something. He and my dad set about an investigation. In the course of the investigation, the dryer (which, like the washing machine, is in the kitchen, though they aren't next to each other, GO FIGURE) was moved away from the wall, leaving the vent hole in the floor exposed. Cut to Saturday night. I was sitting in my living room watching TV, when all of a sudden something small caught my eye at the left corner of the entertainment center. It cut in and out of my field of vision enough for me to discern it's distinct mouse-like-ness. I quickly called Jason in on the situation. The mouse ran around the edge of the wall, across the doorway that leads to the hall, and behind the couch. There, we lost him. Since it was so late, we decided to let him have one more night of reprieve and get some traps the next day. Also, since rodents are mostly nocturnal, Jason decided it would be most efficient to wait until bed time to set them. All that night, I was edgy. I heard the floor creak, and asked Jason if that could be the mouse, coming to get us. About 11 p.m. last night, we heard a satisfying "snap." Jason got up to investigate (yes, alone!) and found one dead mouse beside the refrigerator. I slept soundly, thinking our problem was over. Jason asked me to check the other traps this morning, but I thought that if we'd caught another mouse in the night, surely we'd be able to smell it by morning. As I was leaving this morning, my eye caught something behind the couch. It was small, brown, and attached to a mouse trap. I once again summoned Jason, my Knight in Shining Armour. He'd better not even set those traps tomorrow, because he'll be gone all day and I do NOT deal with dead animals of any sort. Not the fish. And most certainly not mice. I'm pretty freaked out right now, to think that we had not one but TWO. And if two, who knows how many more came up through that vent hole? 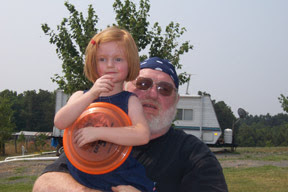 That's my dad, holding Anna Marie on a family trip a couple of years ago. Today is his birthday! He's 56 years old. No, he isn't a biker, despite the do-rag. He does like motorcycles, and has owned a couple in his life. He wears the bandannas to protect the delicate skin of his bald head. Last night we traveled about 40 miles to meet him at an Italian restaurant he really likes. He was supposed to come there after he got off work, but as we pulled up, we realized the place had gone out of business. Guess where we ended up. Go ahead. Guess. He really likes Cici's. It was his idea. He gets them to custom make his favorite pizza - tomatoes, onions, sausage, and green peppers. So there we were - awash in a sea of noisy kids. It was great. Afterwards, he wanted Cold Stone Creamery for dessert. They were out of business, too! We came back to my house, and ate a peanut butter pie (made with tofu, by the way) that my sister had made. Peanut butter is just about my dad's favorite thing in the whole world, so that worked out well. He doesn't even mind the tofu. Much. He spent his birthday helping others - he looked at an electrical problem at my house, and then he went to get lumber for my aunt who just had a new manufactured home moved onto my parents' land. That's my dad. Always helping every one else. At supper time, he decided to go to Western Sizzlin. When we got there, the most wonderful thing happpened. He got to eat for free! Seems that if you come in on your actual birthday, they give you either a steak or a buffet for free. He decided on the steak. So all in all, he had a pretty good birthday. I don't know what other folks got him, but I found him a clock shaped like a tire. He's a mechanic, so of course, he loved it. I don't know if mom will let him put in the house, though, or if it'll be relegated to his shop outside. Let me say it again - Happy Birthday dad! It's finally time for the Blog Party from 5 Minutes for Mom! Finally, a party I'm invited to! Yay! Ok, so we're supposed to introduce ourselves. My name is Melissa. I'm 30 years old, I'm married, and I have a five and a half year old daughter. And no, she's not in school yet because her birthday was a month after the cutoff. And no, she wasn't a bit happy when she found that out either. I work full time at our county's only newspaper. I'm the News Editor, which is really just a fancy word for "the only person in the county who attends all the events, public meetings, and other functions, takes pictures, writes stories, and lays out newspaper pages." I also write editorials each week, in addition to my feature and news writing duties. Sometimes it's fun - today, I spent about an hour taking pictures of first graders wearing striped hats for Read Across America Day (and it's also Dr. Suess's birthday I think). Sometimes it isn't - in about a month, I have to cover my first murder trial. I like to scrapbook and make cards, but I don't have time for much of either. So I just look at other people's stuff and sigh. My husband and I lead music at our (very small, located in a strip mall) church. We've been married for nearly nine years. And if you read this site any time at all, you'll know that I'm fighting the Battle of the Bulge, like many of you are. I've lost nearly 70 pounds so far. I've been blogging since last summer, and I've met some really wonderful folks. I hope that you'll stop by, stop lurking, and post a comment! And I'm always in need of another blog to read, so I can't wait to meet all of you! So to sum up: Welcome to Melz World! Oh, wait. Too much James Brown-isn't-buried-yet news coverage. What I meant to say was, I'm starting March out on a good foot. I'm down a half pound! Half a pound of the pound-and-a-half I gained over the last two weeks! So, I'm back down to 167.5.